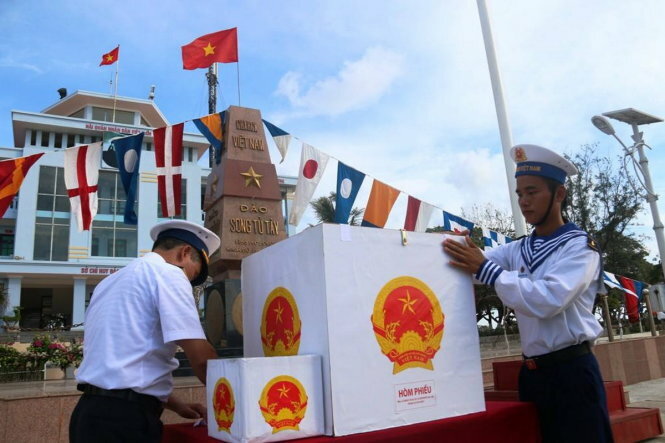 Voters on Song Tu Tay Island, part of Vietnam's Truong Sa (Spratly) archipelago in the East Vietnam Sea, prepare the ballot boxes for the early voting on May 15, 2016. Vietnam is set to begin elections this week for the 14th term of its lawmaking National Assembly and local-level People’s Councils on Sunday, but details about event can be a bit confusing to those not familiar with Vietnam’s electoral process. To straighten things out, here’s a brief overview of the five-yearly election. National Election Day, to be held on May 22, 2016, was set by a resolution the 13th National Assembly reached on November 24, 2015. Early voting is allowed in some remote areas. On Election Day, voters from 184 electoral units across Vietnam will cast their ballots to select 500 delegates from the 870 final candidates for seats in the country’s legislative body. The newly elected lawmakers will serve from 2016 to 2021. The election is organized and supervised by the National Election Council, chaired by Nguyen Thi Kim Ngan, chairwoman for the 13th tenure of the National Assembly. According to data from the National Election Council Office, of the 870 candidates, 197 were nominated by the central government and 673 by local governments. While 162 people registered as self-nominated candidates, only 11 of them made it on to the final list. Three hundred and thirty-nine candidates are women, 204 are from ethnic minorities, 97 are non-Party candidates, 168 are running for re-election, and 268 are under the age of 40, according to the same figures. Hanoi and Ho Chi Minh City have 50 candidates each running for a combined total of 60 seats on the assembly. The National Assembly is Vietnam’s legislative body, while the People's Council is the local legislature in provinces and cities across the country. The People's Council is elected by local residents and is responsible for passing resolutions (formal orders from superior organs of the state) and acting on behalf of the constitution. The council is also charged with forming plans for their area’s socio-economic development, setting the budget, and providing defense and security at the local level. The People's Council is also charged with electing a People's Committee, its executive organ. The People's Committee is responsible for implementing the constitution, the law, the formal written orders of superior state organs, and the resolutions of the People's Council. In Vietnam, any Vietnamese citizen over 18 years old has the right to vote in the national election. Sunday’s election is officially scheduled to run without pause from 7:00 am to 7:00 pm. The schedule may be changed in some cases, but is not permitted to begin earlier than 5:00 am or end later than 9:00 pm. The newly elected National Assembly is expected to convene for its inaugural session from July 20 to August 9, Nguyen Hanh Phuc, general secretary of the National Assembly, said at a meeting of the 13th tenure legislature in April. During the maiden session, the 14th National Assembly will vote on such positions as its chairman, state president, and prime minister.